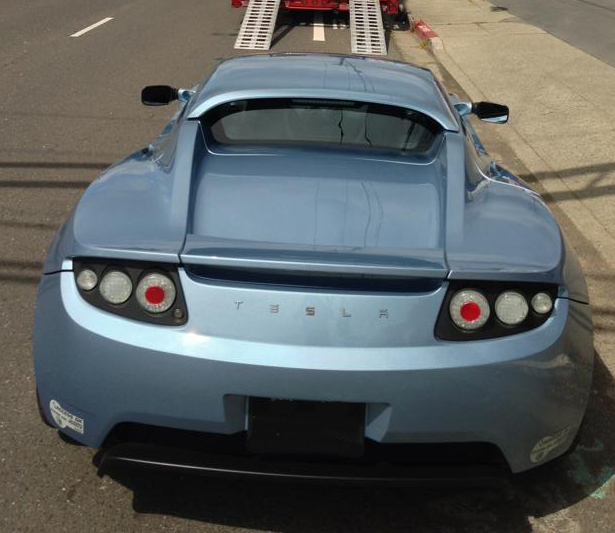 I could not justify keeping two high priced electric cars and sold the Roadster. I am going to share a few thoughts about my impression of the process and the different ways to sell the car. My thoughts are all completely subjective but might be useful for someone else in the same process. Trade in to Tesla directly. All three methods have advantages and disadvantages. Trading into Tesla is the very easy method, but they take a large chunk of cash for the service. Another advantage is that you get the value of the trade in immediately and do not have to wait till they sell the Roadster. They also sell the cars for more to the end buyer. Selling the car yourself is always a hassle. I’m personally not a negotiator by nature. I’ve only sold one car in the past. I usually drive my cars till they are quite old, and not worth a particularly large amount of money. The other three cars were donated. One vehicle was worth less than the repair cost and given to a tinkering friend. The other two were donated to two different charities. Almost any charity will take a car as a donation that is in reasonable shape. They will have an employee basically do the same process that an individual will do to sell the car. Well, the Roadster was worth more than a few thousand dollars, so did not qualify in the donate to charity category, and would probably be too unique of a car to burden a small charity with. I liked the straightforward process Tesla went through with a quote for the Roadster. I just thought I was leaving money on the table. Tesla ended up giving me a lead on a 3rd party sports car dealer, whom other Roadster owners had used in the past. I ended up going that route, and found the experience to be pleasant. Since I have had only one transaction with this organization and am cautious with public recommendations, I am not going to name them. Unfortunately, I doubt there are too many reasonable “used car dealers” out there, but this company was fine and familiar enough with electric cars. The company offered two methods – an outright purchase or a consignment. The estimates for the consignment range were of course higher than the immediate purchase. I went with the consignment as I was not in a hurry to get the cash. I started the process right before Christmas. I was warned that the business for these types of cars is very slow around the holidays and really does not pick up till spring. In the end, they were right and the car sold around the change of the weather. I did not end up getting more than the initial outright purchase price though. I think there had been a mini-glut of Roadsters early this year. A lot of folks who owned Roadsters were trading into a Model S. A lot of folks like myself were more interested in the electric car aspect of both cars than really wanting a sports car or even a large luxury car. I’d prefer the Model S about 10” narrower. There definitely seemed to be a drop in the selling price of Roadsters in early in 2013 – not huge but apparent. The number of Roadsters advertised seems to be dropping recently. Probably as the electric enthusiasts have already moved on to the Model S.
In the end, I netted $5K more than if I had traded in directly to Tesla with a few month delay and no real hassle. I may have gotten a bit more if I sold it on my own but I cannot imagine it have been worth the hassle as the buyer was out of state. On the various Tesla forums there is a lot of discussion on merits of the Performance and Performance Plus options. I thought a blog post in summary of the differences would be helpful. Speed – High performance drive inverter. The performance option decreases the 0-60 mph time of the car from 5.4 to 4.2 seconds with the use of a high performance drive inverter. The torque ratings are 362hp for the 85kWh version and 416hp for the performance version. Conflicting accounts on the forums exist in what speed range the performance improvement exists. In comparison to the Roadster I drove for four years and my 85kWh battery version of the Model S, the clear difference to me is from 0-30 mph. Since the Roadster was so new in the electric car world, I took a lot of people for rides. I am very familiar with the shrieks and fear of the acceleration off the block. I had to always search for an open stretch of road without traffic to demonstrate the amazing acceleration. Although the Model S without the performance option is very fast, in the 0-30 range the acceleration is simply not as fast. I do not notice the difference above 30mph. The simple cost difference is $15K on the surface if you look at the package pricing of $72,400 vs $87,400. The performance package also includes the beautiful 21” tires for $3,500, napa leather for $1,500 (in 2013), and active air suspension for $1,500. Assuming you want all these options, the inverter costs $8,500 dollars. A few cosmetic things are also included in the performance package: carbon fiber trim, contrasting piping on the leather trim and a Alcantara headliner. Alcantara has the look of suede but is made out of polyester and polyurethane. I personally don’t particularly care for the two toned leather treatment. I feel as it detracts away from the bare bones “Steve Jobs” aesthetic. I also did not find the carbon fiber or alcantara headliner trims compelling. Add in another $6,500 and you get improved handling, range and a more comfortable ride. Tesla has improved versions of dampers, bushing, stabilizer bars and tires. The improved acceleration occurs on low grip surfaces, and the range improves 6 to 12 miles. I live in a community that has a fair amount of traffic, a ton of bicyclists, some pedestrians and fair amount of wildlife. For the most part it is simply unsafe to really enjoy the full performance aspects of a car. To show of the Roadster, I always had to search out an un busy stretch of the road. I am unlikely ever to go to a racetrack, and rarely go somewhere just to go on a drive without a destination. Occasionally I do miss the full acceleration of the Roadster in cases where I am going from zero to freeway speed with no other cars in sight. I still get the G forces I like above 30mph. I can also pass other cars and get around them with more than enough ease and fun. On country roads it feels almost instantaneous to pass a slower driver. I am more than happy with the handling of the 85kWh battery version. I actually like the way it handles better than my Roadster. I have no interest in the performance plus for the type of driving conditions in my location. For handling, my biggest concern is simply the width of the car. I would prefer a car about 10” narrower. It feels like it takes up every inch of the road leaving no wiggle room. I always consider the opportunity cost of spending money. Even if you have the available cash, how else could that money be used? Not necessarily for a purchase for yourself or those close to you but how about charity? $8,500 can provide 4,722 meals at the Star of Hope Soup Kitchen in Texas. $8,500 can keep a homeless person off the streets in Fort Lauderdale for 8.5 months. And the additional cost of both packages will increase your insurance by an amount. Occasionally I had regret pangs in the first month not getting the performance version as it did miss the head snapping zero to 30. As a child I loved roller coasters. But after a while, I made the right decision for me. My driving conditions simply do not justify the opportunity cost of $8,500. Since I initially wrote this post, I have driven a Performance Plus for 4 days. I have reviewed it on this post. Tesla marketing did a good job this holiday season. 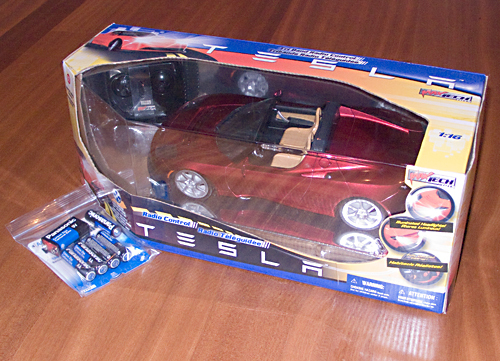 The present is a motorized toy Roadster including the batteries. Although I personally have no interest in the toy, I can re-gift the car to a young boy or a charity toy drive. I am sure someone out there will enjoy the gift someday. This gift is much better than the previous gift box. 1. 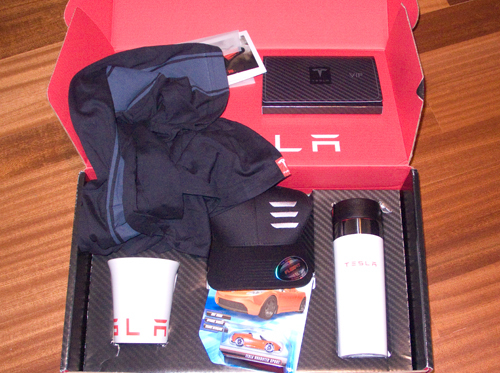 A ceramic Tesla mug – probably the best thing in the box. I may keep this for a short time. 2. A hot beverage portable mug. Unfortunately the inside is plastic which probably has BPAs. I plan on giving this to Goodwill or an equivalent charity. 3. A Tshirt. Of reasonable material. Of course, unlikely to fit. Goodwill. 4. A baseball cap. I just don’t wear baseball caps myself. I may keep this for a bit for the odd chance I may wear a baseball cap. 5. A bunch of note card sized brochure things. Don’t have a clue what Tesla thinks owners would do with these. I put these in the recycle bin. 6. A bunch of playing card sized VIP things. I guess Tesla thinks we would give these out to friends. I put these in the recycle bin. 7. A Hot Wheels Tesla car. Goodwill. Kind of a shame that there is nothing in this box of any interest. Would have been much nicer to have just one correctly sized shirt or something than a box of really nothing. Being an electric car owner, living in California, and supplying the car’s energy needs through solar on my roof at home, I decided the best license plates would somehow contain that message. In California, finding an unused license plate is a bit of a challenge. Californians also have several interesting background options depending upon the cause that extra dollars support. Wayne Thiebaud, one of my favorite painters, designed the plate that supports the arts and contains palm trees and a sun. Thiebaud’s design combined with the word SUN or SOL is perfect for a solar powered (at home) car. I am a bit cynical about charity efforts that mix travel and charity. I have supported some of these charities in the past, but now I question how much of the charity dollars are used to support the cost of the trip. I have seen several where 40-50% of the donations are for travel and logistics. If you want to complete a marathon, is it necessary to go to Hawaii? For the most part travel is fun and I personally think the participants who can afford it should first pay the cost of the trip and then request donations. Then those that pledge dollars know their dollars are going directly to their charity. Sadly this is rarely the case. In relationship to Tesla, a charity called Renew America Roadtrip http://renewamericaroadtrip.com is driving across country in a Tesla. I think they are leaving New York today. Their sponsors include Nissan and Garmin, and the charities they support include an odd mix of the Autism Society of America, the Good Samaritan Shelter, and the Electric Auto Association among others. Their website is a bit difficult to get a good handle on their goals. I enjoy traveling but I am not sure I would want to travel across America in my Roadster. The Roadster is a sports car not a luxury car. For a long drive with perhaps 400-500 miles on some days, I would prefer to take a larger car with a softer ride. The model S would perhaps fit the bill perfectly.